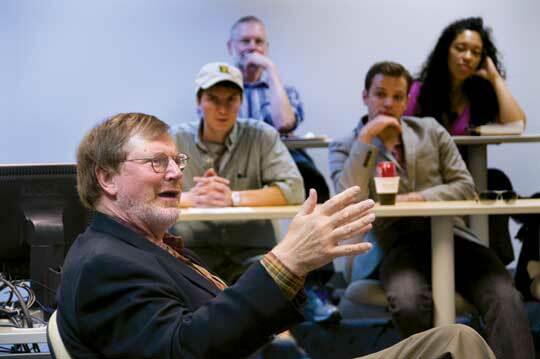 For young people who want to pursue a career in law, Whitman is a great launching pad, James “Jim” Robart ’69, federal district judge and chairman of the Whitman College Board of Trustees, told students in an informal classroom session this fall. He spoke briefly about his career in private practice and public service, and then answered questions. One student said he had heard that Whitman students might not be well suited for law school because they are encouraged to think creatively and express themselves freely. Robart strongly disagreed. Federal judges in the United States can do a lot of good, Robart said. For him, doing the right thing included leaving private law practice to serve as a judge for the U.S. District Court for the Western District of Washington. Prior to his appointment, he was the managing partner of a Seattle law firm. “I took a two-thirds pay cut to get death threats once a month, but I’m benefiting society,” he said. His advice to students considering a law career: Take courses that require a lot of writing and provide critical analysis of that writing, seek internships at law firms to determine whether the career is a good fit, and earn good letters of reference — they do matter.